In the movie “Jericho,” best friends Jerico and Jarvis were headed on a spontaneous road trip when their plans took a major wrong turn that jeopardized their lives. 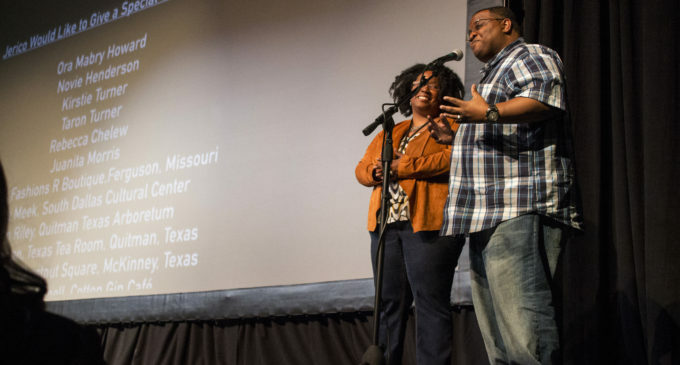 “Jerico”, a story of “two boys trying to keep their black asses alive,” was screened at 4:45 p.m. on Saturday, Jan. 28, at the Campus Theatre. It was a feature film of the third annual Denton Black Film Festival. In present-day, an older man reminisces about Jerico and Jarvis’ story of unlucky adventures in rural, 1960s Mississippi. The two young men face many forms of racial discrimination at the start of the Civil Rights Movement. However, their tale is told in a rather humorous format, in such a way that the audience can “laugh through the pain” of some very disturbing issues. The sold-out screening had the entire audience howling in laughter. Witty dialogue and some shock factor kept viewers engaged and at the edge of their seats. While many other films regarding the same issues of the time period are often serious and somber, “Jerico” seamlessly intertwines the social injustice with slapstick comedy thanks to clever writing and outstanding acting. Brandon “SnackBar” Lewis starred in the film as well as wrote it. Those impressions were clearly put to good use throughout the film, giving the audience plenty to laugh about. The plot of “Jerico” is unpredictable. Three different time periods are shown, all of which are related to one another. The audience will meet unlikely heroes as well as unlikely villains, making the story virtually incomparable to any other film. “Jerico” brings the audience the thrill of an action-comedy while successfully portraying narratives about racism, black culture and white supremacy in a rural setting. The effortless marriage of the the two genres make this film exactly the kind of movie our country needs to see today.